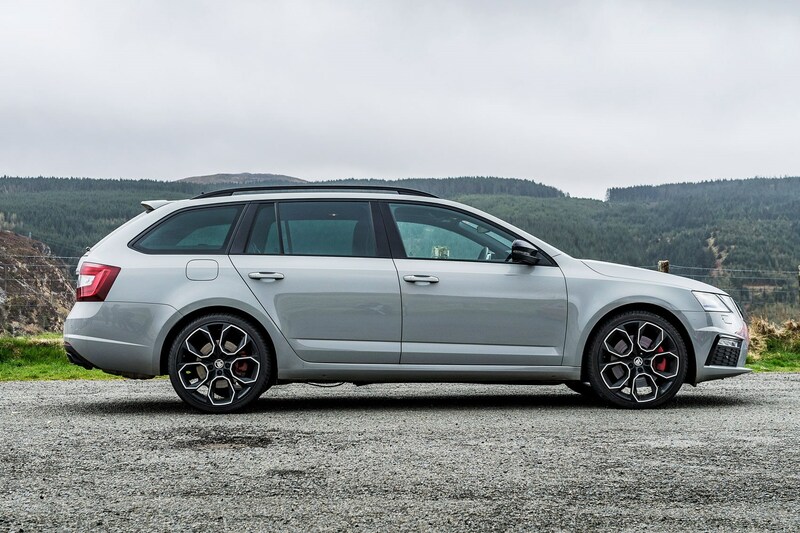 Do you like the 19in alloys on our Skoda Octavia vRS 245 Estate? Similar, yet different: the volume controls flip from left to right, Skoda to Audi. Why? Like the idea of a Golf GTI but can't live with the lack of load space? 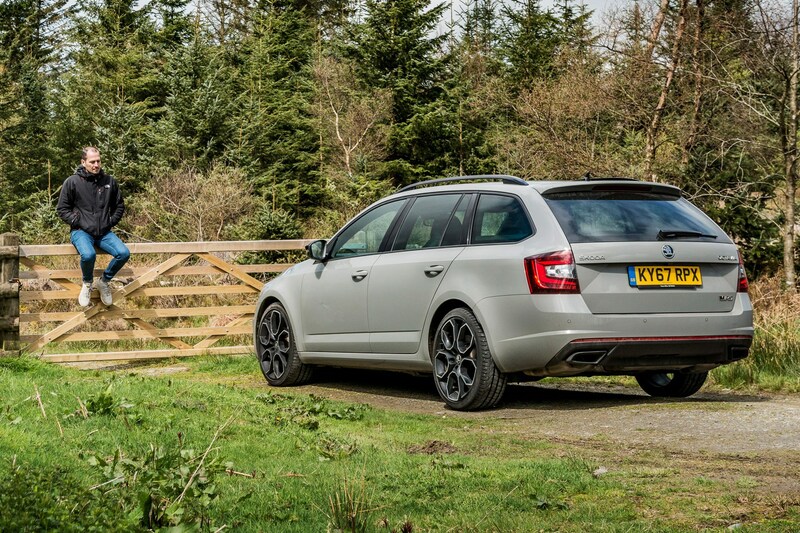 That's where the Octavia vRS comes in – and has done since the first one appeared back in 2001. Then, there was just one engine, a 78bhp petrol, one body style, a five-door hatch, and you got front-wheel drive and a five-speed manual whether you liked it or not. These days you can have manual or auto, diesel or petrol, hatch or estate, and there's also this car, the range-topping vRS 245. But is the 245 worth the extra £2410 over an already excellent 227bhp vRS? That's what we've been chewing over during the last six months. For that additional cash you get a 15bhp boost in power to 242bhp, a limited-slip differential and slightly bigger brakes requiring a jump in wheel size from 18- to 19-inches. And if that recipe sounds familiar it's very much in line with the Performance Pack option on the Golf GTI – which sticks with the standard 18-inch rims and has a premium of only £1465. To start, it's worth saying that almost everything we love about the stock vRS is preserved here. It's massively practical, discreet and full of clever Skoda touches like the rubber handle for pulling the boot closed. Our family car, a current-shape Audi A4 built from the same platform, rarely got a look-in when we had to choose because it was so cramped in comparison. The Octavia's optional widescreen nav looked beautiful and worked really well, though I'd have preferred an old-fashioned rotary volume knob. And the adaptive dampers definitely helped take the sting out of the harsh ride on those big 19-inch rims. The ride – and the fear of hitting a pothole and popping one of those shallow sidewalls for a second time – spoiled the fun, though. And I wasn't impressed by the stop-start system, which annoyingly kills steering assistance when you're still moving, or the optional DSG gearbox's clunky drive take-up and occasional dead moments during kickdown. You get a seven-speed DSG on the 245 as opposed to the six you get on the standard vRS with its optional DSG 'box, and on this evidence I'd stick with the slick manual and save a few quid. And given the modest 0.1sec 0-62mph improvement over a 227bhp vRS, and styling that offers little visual differentiation bar black detailing and evil-looking rims, the value in the 245 pack isn't as clear cut as the GTI Performance Pack's is at a grand less. Ultimately it's not that the vRS 245 isn't a great package, because it is. The handling is even sharper and that e-LSD saved my bacon in the snow. It's simply that the standard car – available to lease for almost £150 less per month – is so good. In fact we'd go as far as to say that a standard vRS is one of the most sorted, best value cars on sale today. Which ought to be the end of the story, except that while digging those lease figures out I stumbled across some for the Golf R estate. Four-wheel drive, 65bhp stronger and one of our favourite wagons, it's available for £80 less than the 245. The Octavia might share its platform and running gear with other VW Group companies, but it’s interesting to note how different VW Group cars can be in the details. Our vRS’s starter button, for instance, is where you’d expect a key to be (and where it is in lesser Octavias), which of course makes perfect sense. But for some reason the Skoda’s rolling volume control is mounted on the left spoke of the steering wheel, when our family Audi’s is more conveniently mounted on the right spoke – handier when stirring the manual A4’s gearstick. Small detail. Big difference. A key component in the 245’s goodie bag is an electronically controlled limited-slip diff. Push the Octavia hard through some tight turns, particularly on track, and it’s a real help delivering the 242bhp (245ps) to the front wheels. Here’s another benefit: the Octavia’s Pirelli P Zero rubber is terrible in snow and slippery, low-traction conditions – but the e-diff brings some compensation. A Ferrari engineer once told me that during 458 testing if ever a car landed in the gravel they would just grab the laptop from the passenger seat and tell its e-diff to lock solid. The 458 would escape the sand without needing a tow. I didn’t have a laptop to hack the Skoda’s ECU but, if I kept the wheels straight and barely touched the throttle, the differential made sure both wheels turned together instead of spinning power away, and I managed to claw my way past several other floundering open-diff cars up steep snow-covered hills (‘Sorry, I’m sure help is on the way!’). Turning was more tricky – the vRS just wanted to understeer – but there’s no doubt the e-diff saved me from sleeping in the car when the Beast from the East hit big in the south west. 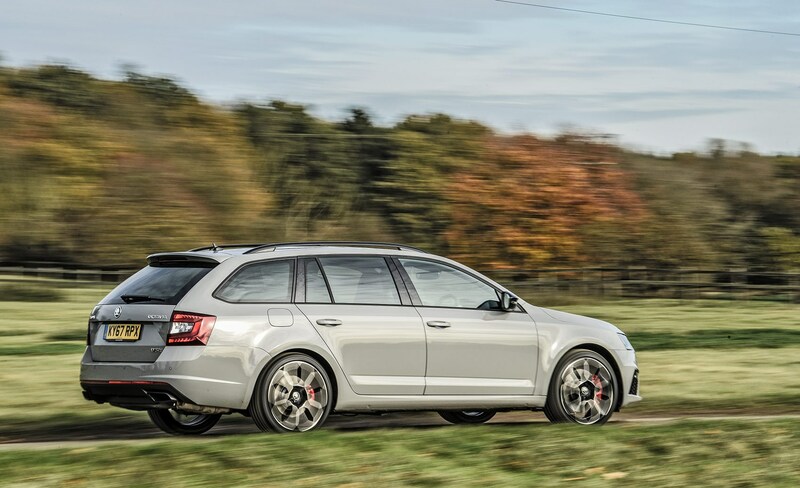 Month 3 of our Skoda Octavia vRS 245 long-term test review: puncture! I’m kicking myself for not ticking the £105 space-saver option. It’s Saturday morning, first day of the school holidays. A seven-hour drive to Granny’s beckons. The last thing we need is five stationary hours before we’ve even set off. After ditching the dog at the kennel there’s an ominous thunk as we hit one of Devon’s million covert potholes. I jump out to confirm the worst: the off-side front tyre is pancaked. Predictably, it’s tipping it down. I flip the boot carpet. No spare. No get-me-home skinny space saver, either. Just a can of foam I can’t use because foam can’t fix split sidewalls. 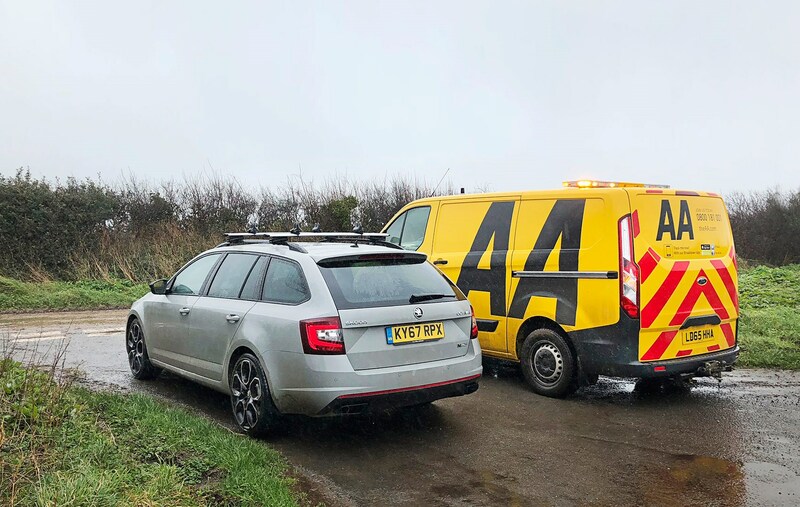 AA man Paul arrives 80 minutes later, admits this happens all the time with modern low-profile rubber, jacks up the vRS and throws his yellow AA space saver on. Klang! It won’t fit over the 245 vRS-specific bigger brakes. Me and two kids is one body too many to fit in his van, so he can’t tow us either. So we wait while he disappears to a tyre retailer in Plymouth to get our wheel wrapped in new Pirelli P Zero. Thank God for Netflix’s phone app and the Skoda’s comfy seats. The five-hour fiasco meant the day was a total loss instead of the 10-minute inconvenience it would have been 20 years ago, when full-size wheels were still the norm. I’ve heard that about our Skoda more than once since taking delivery. The unusual Meteor Grey paint has met with wider approval than I’d expected. But the garish 19-inch rims don’t quite gel with the Octavia’s sober lines. Or the road surface. To be blunt, the ride is abysmal. Thump into a hidden pothole and you really do feel compelled to get out and check the car’s in one piece. And if potholes don’t get them, kerbs will. My old Audi Q5’s same-sized rims featured pudgy muffin-top sidewalls that kept the rims unscathed. But the Skoda’s nearside front already has a nasty parking scar. On the flipside, the Skoda’s low sidewalls and generous contact patch are great for steering precision and traction. Voluminous? Versatile? Vast? Vroomy? When it comes to what the ‘v’ in ‘vRS’ stands for, all of those words apply to our new Skoda Octavia 245, but none is actually correct. Apparently it’s not a letter ‘v’ at all, but a hachek diacritic, which means it’s one of those inverted hats from the Czech language that you’d also see above the ‘S’ in Skoda if we bothered to present it properly. The vRS brand has been around since 2001 (though in other markets cars are badged purely as RS) and a chunky 20 per cent of all Octavias sold in the UK get the performance treatment. But the car we’ve got here is a little more ‘v’ than the rest. Skoda has offered a choice of diesel or petrol power in the Octavia vRS for years but with the recent facelift of the third-generation car (characterised by some uglier but more distinctive headlights) it’s now introduced a higher-power petrol option for the first time: the vRS 245. In concept it’s very similar to the Performance Pack option you can tick when ordering a VW Golf GTi. For £2410 over the £25,185 cost of a regular vRS you get a power increase from 227bhp to 242bhp, plus bigger wheels and some smart black trim on the grille, the mirror caps and the tailpipes of the fruitier exhaust. If those sound like expensive ponies then consider you also get lower, stiffer suspension and an electronically controlled limited-slip diff that’s exclusive to the 245 and might come in handy because the only four-wheel-drive vRS is the diesel. And finally, if you choose the optional DSG ’box over the six-speed manual, you get seven ratios instead of the ordinary vRS’s six. The vRS hatch has a huge 590-litre boot and the £1200 pricier estate’s is technically only 20 litres bigger with the seats up, but we went for the wagon anyway because it’s more usefully shaped, not least for my dog. And we splashed out again, this time to the tune of £1390, for that 245-specific seven-speed dual-clutch transmission. If the ordinary vRS colour palette is limited, the 245’s is almost Model T-like. We picked out Meteor Grey, which is a £380 option and has been around for a while, but still looks very cool and hides winter grime well. Sticking with the muted theme we decided against the red-accented seat trim, but did throw in a few options. There’s DCC adaptive dampers, not cheap at £850, but probably a sensible idea given the up-sized rims; keyless entry and start at £400; £1150’s worth of panoramic roof to throw some light on the very grey interior; a reversing camera (£375); Canton hi-fi upgrade (£500) and the very slick Columbus sat-nav system with Smartlink+ and integrated wi-fi at £1050. That lot makes this a £37k car – not bad for the spec, quality and performance, but far removed from the £25k a basic vRS hatch costs. 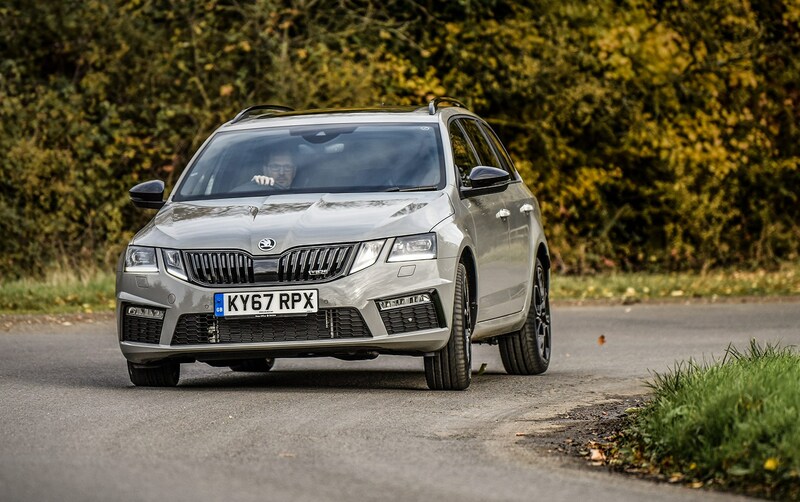 Is the 245 worth the extra outlay or would you be better off in every sense sticking to Skoda’s value-conscious roots and choosing the already excellent standard vRS? Stick with us and we’ll find out. 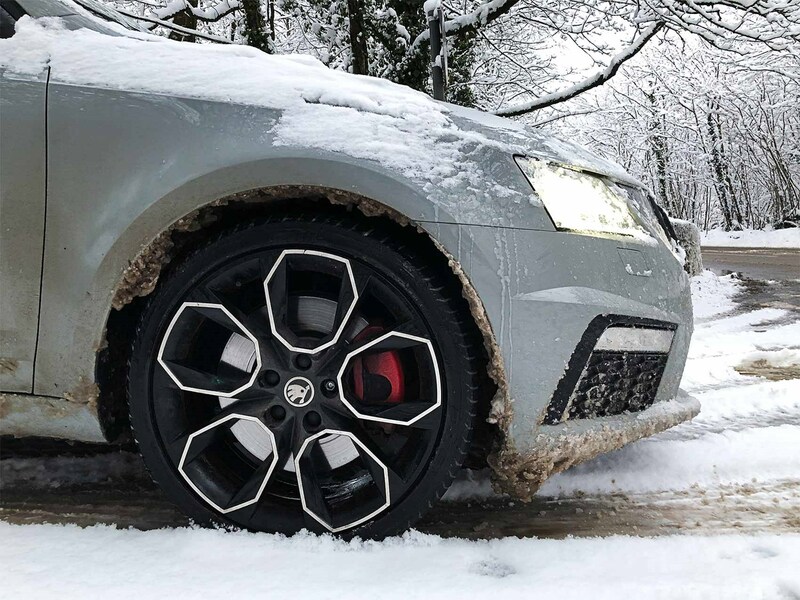 Skoda Octavia vRS 245: e-diff means traction's actually rather good This is what happens when you don't have a spare wheel Do you like the 19in alloys on our Skoda Octavia vRS 245 Estate? 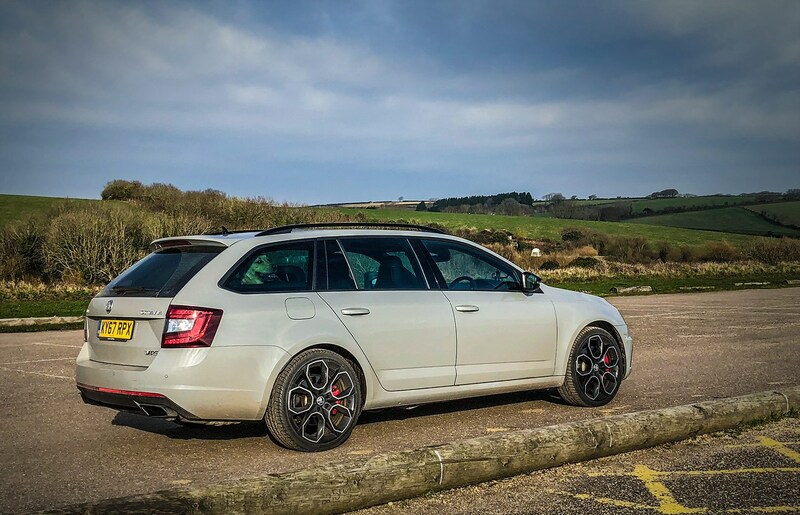 Stealth grey: meet our new Skoda Octavia vRS 245 Estate long-termer With 242bhp, our turbocharged Skoda Octavia vRS 245 Estate ain't slow... Similar, yet different: the volume controls flip from left to right, Skoda to Audi. Why?